Cam and I have decided we want to spend a profoundly healthy second half of our lives together so we are living and laughing and feeding our body minds and souls now in the best ways to Flourish on every level…. Did you know? According to the US National Cancer Institute’s Surveillance Epidemiology and End Results (SEER) Database, 43.3% of American males and 37.8% of American females will develop cancer in their lifetime. That’s a staggering number. Almost one out of two men and a little more than one out of three women. So what can you do about it? beforehand? There has been a lot of research into preventative measures, even some done by the American Cancer Society (surprisingly) but it’s all scattered and unclear in many ways. Apparently these foods listed below,are powerful enough to keep your body in a peak state of health and avoid cancer from developing in the first place. 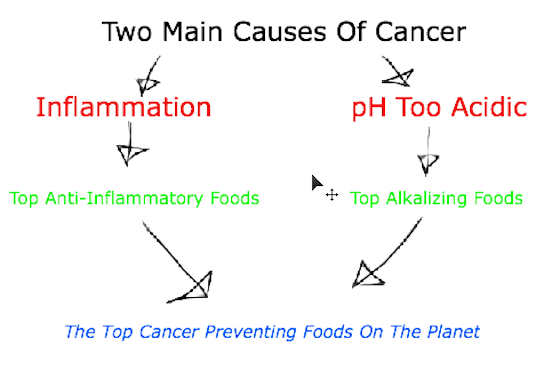 Source the top alkalizing and anti-inflammatory foods on the planet these must then be the best cancer prevention foods as well. 1. Kale: Kale is one of if not the richest alkalizing food on the planet. It’s rich in many vitamins and minerals that alkalize like calcium and magnesium. It’s a great source of chlorophyll which plays an important role in alkalizing the body. This is also a very strong anti-inflammatory food because of the omega 3 fatty acids contained in this green so it really tops this list in two ways! (It can be as bitter as all heck, so we blend ours in with our juices or smoothies and add 3- 6 or so Kale leaves or more dailydepending on taste). 3. Broccoli: One of the top alkalizing foods on the planet and a great source of fiber which is healthy for the Colon. It also contains sulforaphane which is a known anti-cancer compound. most green vegetables (because of the chlorophyll content in them). 2. Blueberries: Low on the glycemic index , with a rich blend of nutrients and anthocyanin antioxidants, blueberries protect the brain and aid in anti-inflammatory efforts. . They can also be frozen without effecting their antioxidant benefits, unlike many other foods. Be sure to eat organic blueberries as new studies are showing that organic blueberries have higher concentrations of phenol antioxidants and anthocyanin antioxidants giving you the best anti-inflammatory, anti-cancer effects. 3. Flaxseeds: You may be wondering why flaxseeds made the list right? well, it’s the richest source of omega 3 fatty acids on the planet. Omega 3 fatty acids are one of the main drivers for creating an anti-inflammatory state within the body. Other anti-inflammatory foods include, fish, walnuts, ginger, cloves, garlic. And there you have it, eat more Kale, Lemon, Broccoli, Turmeric, Blueberry and Flaxseeds to prevent cancer. Notice one more thin g, Kale is green, Lemon is Yellow, Turmeric is orange, blueberry is blue and flaxseeds are brown. Notice the different colors? Eat the rainbow !!! you’ll feel a dramatic positive effect on your mental, physical and emotional health! Please share this article to help spread the word about these amazing foods and help inspire more healthy choices! Laughing, Hugs and Quiet Time in Nature just feelin will all boost immunity and destress you quickly strengthening your Life Force! ! Pubmed.gov, Duke University, whfoods.com, Dr. Andrew Weil, Dr. Joseph Mercola, David Benjamin.